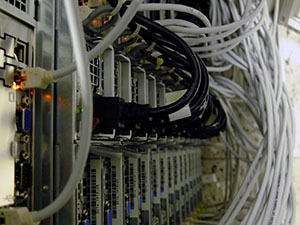 Cube operates specialized high-performance computing infrastructure for bioinformatics and computational life science. The main difference to larger, generic computing facilities, such as the Vienna Scientific Cluster (VSC) is the equipment with a rich, flexible and up-to-date bioinformatics software repository and the availability of major biological databases on-site. This installation allows typical users to analyse their data without any software installation, just by using the pre-installed tools and databases. Our infrastructure is friendly to non-specialists, and can be used for data analysis as well as method development and evaluation. For more information and a personal user account please contact CUBE. The Life Science Compute Cluster (LiSC) is a medium-sized compute cluster on PC basis. It consists of head nodes for job testing and submission, compute nodes and a storage cluster. In total the LiSC provides about 800 CPU cores, 800 TB storage space and up to 1 TB RAM per node. Copies of all relevant biological databases (such as NCBI nt and nr) are available as local copies on high-speed disks in all compute nodes. The LiSC storage is configured as redundant NFS clusters, operated in active-active configurations. "Waste" of memory can be negative, which means that the jobs have used more memory than allocated. CUBE operates two dedicated database servers and two redundant virtualization servers. Virtual machines are mainly used to operate our publicly available resources, such as web portals, databases and tools.